Iñigo Manglano-Ovalle, view of Seven Thousand Cords (after Beuys) at Farnsworth House, 2015, Plano, IL. Farnsworth House (Mies van der Rohe, 1951), a historic site of the National Trust for Historic Preservation, and United States Artists (USA), the national, Chicago-based organization dedicated to supporting accomplished and innovative American artists with significant financial awards, have joined together to create a public program for the Chicago Architecture Biennial. 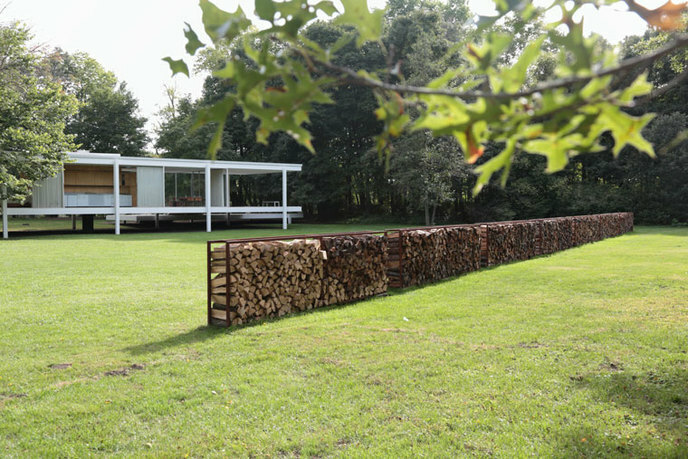 For the program, Architecture + Art: Inspiration Amplified, two USA Fellows are creating new works that are inspired by the Farnsworth House and its landscape. 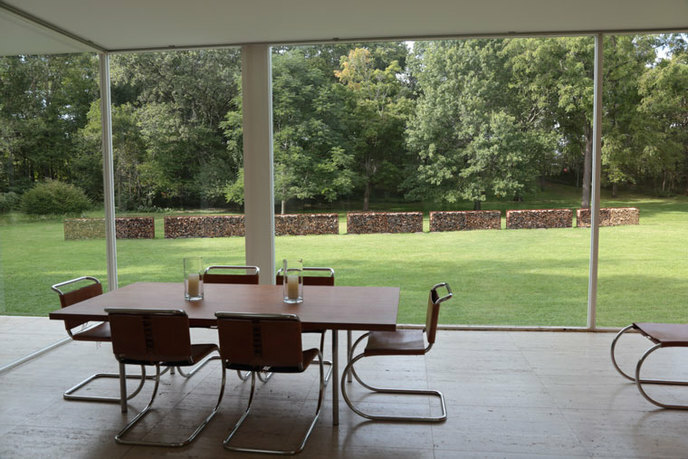 The project demonstrates how the Farnsworth House, an exemplary representation of the International Style of architecture built in 1951, continues to inspire contemporary artists today. Simultaneously, the project showcases opportunities and impacts of new and innovative arts programming at historic architectural sites. Manglano-Ovalle's project deploys a minimal gesture of drawing a line slightly off parallel to the house and using that line to delineate a wall of stacked firewood. Titled Seven Thousand Cords (after Beuys), in reference to Joseph Beuys's renowned 1980s social sculpture 7000 Oaks, it is composed of the basic unit of a cord of wood within a carbon steel frame to be repeated ad infinitum through the lifespan of the work. 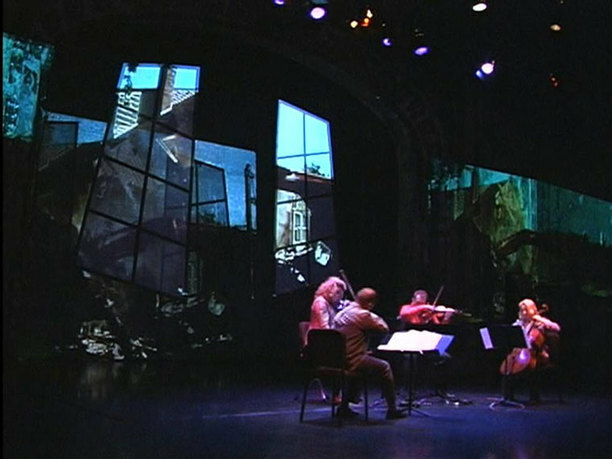 Childs's Stone Steel Glass Wood Light is a multi-movement work for string quartet, written for Chicago's Kontras Quartet. At moments the music may surround the audience, with the four string players in the four corners of the house. The audience is encouraged to think of the house and the space as part of the performance. Rather than configure audience seating to face the musicians—as in most concert settings—listeners will be invited to sit on the furniture, or sit or lie on the floor, look out the windows, and at the architecture itself—in short, to think of the music as accompanying the site. Mary Ellen Childs composes concert work, often with a strong visual element, for a variety of instrumental ensembles, including those for solo accordion, string quartets, and chamber groups. 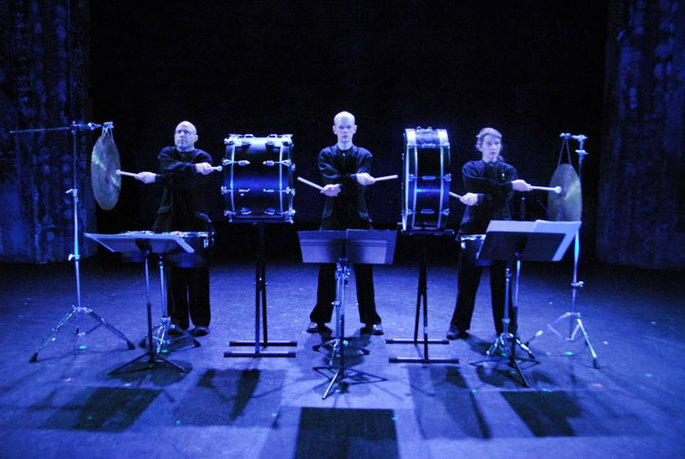 The creator of many multimedia works, Childs is best known for her "visual percussion" pieces for the percussion group CRASH, in which she incorporates the movements of the bodies of the performers. Childs has received commissions from the Kronos Quartet, the St. Paul Chamber Orchestra, the Kitchen, and the Walker Art Center, among others. Iñigo Manglano-Ovalle has a varied and complex practice that encompasses mostly sculpture and video. Manglano-Ovalle often collaborates with scientists on projects that make abstractions, such as one's DNA or a cloud, tangible. These elegant forms often mask political agendas that can include, for example, immigration issues, climate change, or globalization. He has also created a series of sculptures and films based on the modernism of architect Mies van der Rohe. 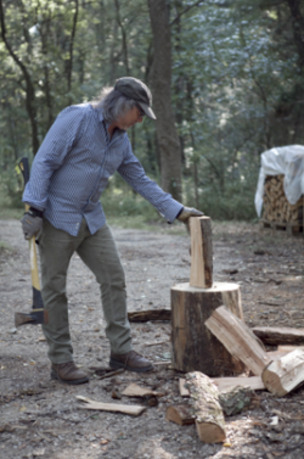 Manglano-Ovalle is professor in the Department of Art Theory and Practice at Northwestern University and the recipient of a MacArthur Fellowship (2001). Benjamin Foch’s experience is in managing rotating art programs through his company, New Capital, where he curates three thematic exhibitions a year, each with approximately twenty artists, developing the content, and everything involved in organizing an event. His experience in art galleries, museums, and international art fairs has allowed him to work with all types of artists and artworks of all scopes. Maurice Parrish, director of the Farnsworth House, has over twenty years of executive experience in major museums and cultural institutions. Previously, he was Executive VP at the Detroit Institute of Arts (DIA), where he expanded public programming to make the museum and its collections more accessible to a broader and more diverse public. He has been a visiting professor of architecture at the University of Michigan and has occasionally lectured on architecture, urban planning, and urban design. Born in Chicago, he holds a BA in architecture from the University of Pennsylvania and an MArch from Yale University. He also completed the Museum Leadership Institute's Executive Leadership Program. Meg Leary joined United States Artists as the director of programs in May 2014. Previously, she was a program officer at the Irving Harris Foundation, a Chicago-based family foundation, where she managed a portfolio of grants to support arts and cultural organizations and progressive media and documentary film projects. Her previous positions include director of development and operations for the Reeling LGBT Film Festival and roles at both the Hemispheric Institute for Performance and Politics and East Coast Artists. Leary holds an MFA from the School of the Art Institute of Chicago, an MA in performance studies from NYU, and a BA from Smith College. The National Trust for Historic Preservation works to save America's historic places. Chartered by Congress in 1949, today the National Trust is a privately funded, non-profit institution. The Farnsworth House, a site of the National Trust, was designed by Mies van der Rohe in 1945 and constructed in 1951. Located in Plano, Illinois, it is a vital part of American iconography and an exemplary representation of the International Style of architecture.